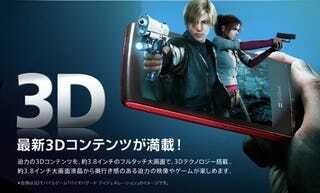 The Sharp Galapagos is an upcoming 3D smartphone. And it's getting a handful of games that mean it might just give the Nintendo 3DS a run for its money. Powered by Android, it boasts a 3.8 inch glasses-free 3D screen, 512MB of on-board memory and so far, the phone is slated for seven games: horror game Resident Evil: Degeneration (the game, not the movie), sports game Mobile Powerful Pro Baseball 3D, platformer Mega-Man, rhythm game Taiko no Tatsujin, shooting game SILPHEED Alternative, platformer Ghost 'n Goblins: Gold Knights and horror game Reikai Denwa. It is also getting 3D movies like Shrek Forever After and Battle Royale 3D. The term "Galapagos" refers to the claim that Japanese cell phones suffer from "Galapagos Syndrome". Sharp is taking what was a dig and trying to turn it into a positive. With mobile phone gaming being incredibly popular in Japan at the moment, this phone, even with its underpowered graphics, does pose a threat to the Nintendo 3DS. How big of a threat? Well, you can't play Mario games on it. And graphics-wise, the Nintendo 3DS (and the iPhone 4, which can't do 3D, for that matter) is more impressive. But for folks looking for a portable device that has glasses-free 3D and can do Japanese phone stuff, the Galapagos is a viable choice.